Some PC applications just work together like two peas in a pod. I’m talking about pairs like Winamp and Last.fm. There’s Skype and Pidgin, Steam and Raptr, and more. When you’re using one of these, launching the next one just feels natural. However, having too many paired program groups like this can really cause some serious clutter on the desktop. That being said, is there really a need to have both shortcuts on your desktop 10 Best Shortcuts to Add to Your Right-Click Menu 10 Best Shortcuts to Add to Your Right-Click Menu The context menu that pops up whenever you perform a right-click can help you become more productive. With the right tool, customizing the shortcuts within it is a breeze. Read More when two applications work alongside each other? If you don’t think so and you’re running Windows, let me show you how to combine both applications into a single shortcut icon for your desktop. The first step to setting this up, after you’ve picked out the two (or more) applications that you want to combine into a single shortcut, is selecting your main shortcut icon. 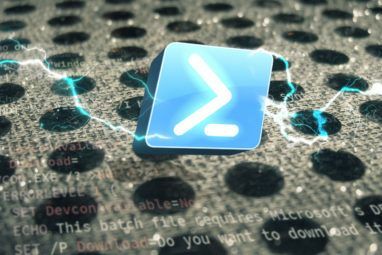 This is an optional step of the process, but bypassing it means that you’ll be using the Windows icon for every batch file as your shortcut icon. If the desktop icon you want to use is already on the desktop, then good. Keep it there. If not, find the application whose icon you want to use (either through your Start menu or through Windows Explorer), right-click on it, and select Desktop (create shortcut) from the Send to menu. The next step is to collect the program paths of the applications that you are trying to launch. Again, to do this you can use the Start menu or Windows Explorer. Simply find the application, right-click on it, and select Properties. The Target field is what we’re looking for. Copy what’s in that field and paste it into an empty Notepad window so that you have it somewhere easily accessible. Do this same thing with the second program that you’re trying to launch. To make this work, we now need to take those two application paths and work them into a batch file. 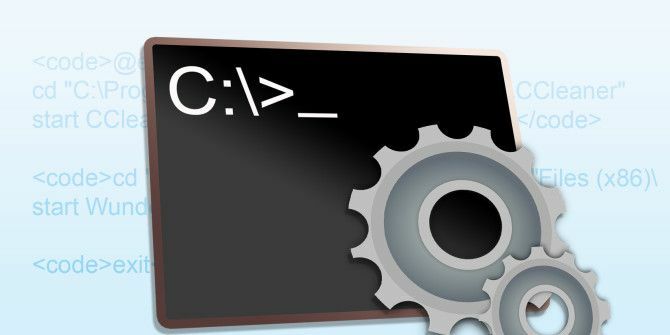 We have explained how to write simple batch file How to Write a Simple Batch (BAT) File How to Write a Simple Batch (BAT) File Batch files can automate everyday computer tasks. 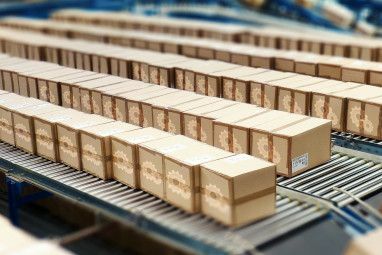 Here's how batch files work and how to write your first batch script. Read More previously. Open the Notepad file that contains the program paths you copied earlier and adjust it to look like the example below. Above is an example of the complete batch file script. Below is a breakdown of what is going on in the script. 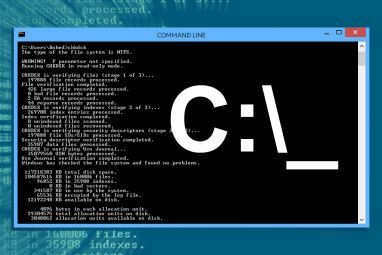 This simply prevents commands from being displayed in the command prompt, which is used to execute your batch file. This is changing our directory to the CCleaner directory (which we got from the program path earlier). This is launching the executable file (that we noted in Notepad earlier) from within the directory we just navigated to. That one’s kind of self-explanatory. In Notepad, save this file (making sure your Save as type is set to All Files) with the .bat extension. Take note of the path where you’ve saved this file at, in Notepad, because we’ll need it in the next step. Remember that icon we placed on the desktop earlier? Right-click it, select Properties, and look at the Target field. This should display the path to your application. Now, change that to the path of your batch file. Click Apply and OK.
Now, double-click the shortcut icon on your desktop. You should see a command prompt window quickly open, then close (as the first line of the batch file forces), then your two applications should launch! As someone who really appreciates automation How To Automate & Schedule Regular Windows 7 Backups How To Automate & Schedule Regular Windows 7 Backups Far too many PC users fail to properly back up their systems and their data. Because of that, I've often found myself in the position of having to tell family and friends that all of... Read More , it’s worth it to take these five minutes of your time to save yourself the unnecessary clicks and effort it would otherwise take you to launch two applications at once. It keeps your desktop nice and tidy, too. Got any neat ideas for other ways that this batch file trick could work? Any suggestions for program pairs that you’d throw in a batch file like this? Leave me a comment below and let’s talk about it! Are batch files really not your thing? Check out my favorite application launcher for Windows Eliminate Unnecessary Reaches to Your Mouse With the Fingertips Application Launcher Eliminate Unnecessary Reaches to Your Mouse With the Fingertips Application Launcher Part of becoming a true power user is minimizing the number of long and exhausting reaches you go for between your keyboard and mouse. We've shared all sorts of keyboard tricks with you before, but... Read More : Fingertips! Feeling cluttered on your desktop but really not interesting in combining shortcut icons? Here’s how to clean up your desktop efficiently How to Clean Up Your Windows Desktop Once and for All How to Clean Up Your Windows Desktop Once and for All Clutter is more detrimental than you realize. A tidy Windows desktop makes things easier to find, is more pleasing to look at, and reduces stress. We show you how to get your desktop in order. Read More ! 5 Ways to Transfer Data From PC or Laptop to Android PhoneGetting A 4K Monitor? Which Browser Should You Use? I'm using Pitikapp, but it relies on other programs to function. So I am making a batch file to start MSI Afterburner, wait 4 seconds, then start Pitikapp. This will help me force my endusers to open what they need whether they know it or not. Sometimes, you have to be facist with software. I hate it, but it's true. This is a Godsend. Thank you. I know this article is pretty old. So you may not even see this. I just wanted to say thanks. Super useful, clear and concise article. This only runs the first one. Once stopped the first one, then runs the second. start "any thing here this is just a title" "C:\Program Files\a program\my program.exe"
Is there a way to have the same Icon open and close the same program? Thanks very good good instructions. Not certain if you mention that you can get the target programs to to run directly by clicking the "gear icon" if you don't want to change the actual shortcut. Thanks for the article, appreciated. Is there a way to also close all the programs from the batch file together by closing one program? That would be helpful too. Is there a way to start a program like the author showed AND have it also do simple keystrokes? For example; open a program, pause for it to load, down-arrow twice and then doubleclick? Check out Sikuli. Didn't take me long to get a few automation scripts made. I like to insert a comment (memory jogger, link, etc...) when I create a shortcut. Currently I use the comment box within the shortcut but it has a max number of characters I can use. Is there another way? I want to shut down network services that cause issues with Reaper daw causing potential dpc spikes. This is the command i have so far. the following services are dependent on workstation service. Stopping the workstation service will also stop these services. I want to do this same thing for chrome browser but the opposite so it turns on the net services? So how do i? I have a large number of audio and video karaoke files (more than 25,000) in one folder and the lyrics of them in another as text or image files. When I have to play Audio/video file without the lyrics, I have to manually locate the Lyrics/image file to sing along. I was wondering if somehow I could be able to open the lyrics file (text/image) when I click the audio/video file. So when I double click on an audio/video file, the associated text/image file would also open along with it (Like mp3 file is a hyperlink to text file). Some mp3 files have text lyrics which I can open in Winamp. But creating/converting all audio/video with lyrics will take years for me taken into consideration the number of songs I have. Please enlighten and help me with this issue. Thank you for your time and efforts. Cheers~! Hey I have a question is it possible to make a batch open with another program? an example is if program a is opened open program b. is that possible, and how would I program it? Interesting question, Shane. I'm pretty sure it's possible. Did you ask this question somewhere else and have you come up with an answer in the meantime? Hmmmm, I like the idea, but it doesn't seem to like some of my commands. Chrome, Word, and Calculator open up on command, as expected, but can I launch a specific file? just opens a cmd window. That's my background music for Winamp, but I also have a database and spreadsheet that I'd like to open directly. "C:Program Files (x86)Microsoft OfficeOffice15msaccess.exe" "C:UsersPublicDocumentsSJDLite2015.accdb"
Never mind, it works, file to copy is on network, its not real big, but the copy took forever so it looked like the batch file was hung up. Just slooow network. I use Lacuna Launcher. It's portable and quite versatile. Like apps in this article, how do i open multiple Windows folders? I keep like 6-7 folders open when i am doing audio compiling in my studio so i need to open with a single click. Is that possible? start explorer.exe "C:Program Files (x86)"
There was a typo in my reponse. There should be quotes around the path only, but I had one after the c: on line 2. Also, the MUO system removes the backslashes from posts on here, so you need one after the colon following the drive letter, and in between each folder name if you go more than one directory deep. Thanks! But in what format do i save it? .bat? Is this a batch file? I tried that but did not suit my purpose. So I disabled all those startup files from registry by means of CCleaner. Then I created the batch file as suggested but not your standard .cmd file but Take Command LE's .btm file and named it Startup.btm. Here I can set exact delay between successive commands and the order in which I want them executed. The if / and /or functions + system variables and functions allow me to check for preconditions being met or looping until they do. Believe me it has made my life so much easier ! Is there a way to pass user IDs and passwords to applications when they launch? I know it is not a secure idea but can it be done? What I did also, was to add a splash screen when starting the programs. Check out link below for the code. Just fiddle a bit with the variables and the "Start programs"-bit. That's a really cool adaptation! #note that you do not add the ~ here because it's in the computer directory rather than the home directory. Again, not entirely sure if this is the case. That's just how I understand it. #as explained before, if you want to add a third program to the list, add a space and a "&" after the 8 in "./gimp-2.8"
now save your file like so "yourfilename.sh", then right click on it ->properties ->permissions -> next to Execute, check the little box. Now double click your .sh file, and it'll either work as expected or you'll see a message asking how you want to run this. If neither happen, you'll have to open the file manager (in my case, since I'm using Ubuntu, Nautilus. Steps might be different for you) ->preferences -> behavior -> under "Executable Text Files" chose "Ask each time" or "Run executable text files when they are opened". Whichever you like best. I prefer using the freeware Startup Delayer, by Jockersoft. It lets you set up time delays between each program launch, so everything is not trying to launch at once. Does Startup Delayer allow you to launch programs in this same way from the desktop, or is that functionality only available during a Windows logon? Do you have a shortcut to open google chrome directly in incognito mode? In the second line replace "start chrome.exe" by "start chrome.exe -incognito". If you add -incognito after the target in properties of the shortcut, you can launch chrome in incognito by double clicking that. Try creating your shortcut, then adding a flag for incognito mode (I believe it's -incognito) to it, then copy the whole thing into the batch file. Simply add the "-incognito" condition to the launch target in Properties. Just tried it, works perfectly.